My friend Casey and I are constantly getting engaged. You should see the way her eyes light up in pseudo-surprise every single time—she’s really something of an actress. If you’ve ever gotten engaged before or perhaps witnessed some crazy kid proposing to another in a restaurant or at the park, then you understand why we do this. Personally, I like to think it improves the romantic stock of every man and woman in the immediate vicinity…they watch us and think, There’s still hope in this big, bleak universe for eternal love and adoration. The best thing about our game is how progressive it is. Casey’s becoming more brazen and, like any self-respecting twenty-first century woman, she finally proposed to me downtown a few weeks ago, on the rolling hill of the pentacrest. I said yes, yes, of course I will…it would make me the happiest man in the world! Some college kids playing Frisbee shouted their approval. Casey produced her father’s old wedding band, a heavy piece of brass that took some effort to work over my knuckle. Then she stood up and kissed my nose. Usually we don’t kiss but that isn’t a rule or anything. I mean, onlookers expect some degree of affection, right? The next best thing about our game is how it can happen at any time, and although we carefully select our engagement locations, the when and how is a mystery. I like it that way. Unscripted. Instead I hugged her right at the moment the Bee Gees came on the outside speakers. I offered my hand to her; we stood up and danced in the limited space between each table. People around us laughed in appreciation and some gushed about the way things like chivalry, romance, and optimism will never die. When the waitress came out with two plates of eggplant ravioli I winked at her. She forced a smile. “Let me know if I can get you anything else,” said our waitress. Last spring break we drove to Daytona Beach to get engaged. We thought: Salty Atlantic spray, luscious white beaches, boat tour, and palm trees. We got: Empty kegs rolling across the beach for the Ninth Annual Beacon State University Fun Run, sea sick, robbed, and mocked by underage binge drinkers. Location is also important when you factor in the risk of being j’accused by some prior witness. So far, no one has yelled out “engagement fraud!” at our spectacle but that’s because of Casey’s impeccable planning. She uses one of those city maps with sectors and grids, working out a system of safe and dangerous sections of town. She told me, “Wallace, if we get discovered there will be no shortage of marital strife caused by our demise.” She actually talks like this, which is why we’re friends. I love the way she strings along a sentence, like she’s sewing delicate patches in torn fabric. Also she’s the only one I know, my family included, who doesn’t call me Wally. My favorite spot to drop to one knee? (Side note: Guys, always drop to one knee. Trust the expert.) The best spot is on the bridge over the reservoir. People fishing down below, tiny as bugs, point up at us and cheer and clap and wolf whistle. The sound of their fevered joy carries over the crashing water of the dam and rushes right through me, where up on the bridge I look into those ever-sparkling eyes of my willing accomplice. Say there is a jar of cookies. Ten delicious chocolate chip cookies in a jar. Each one that is taken by me leaves one fewer piece for Casey. My gain is balanced by her loss, and vice versa, so in the end we have accumulated zero. There are those that say multiple proposals to the same person is a zero-sum game, that you can’t keep reaching into the jar without one player winning and the other losing. I tried to explain game theory to Casey and tell her what could possibly go wrong for us but she didn’t seem to understand. Sometimes I’m bad at explaining things. Or maybe it’s that she doesn’t want to hear the truth, about how we’re defying our culture, our society, and our fathers and mothers who proposed to each other only once. Our parents would say, “Shame on you, thinking you were better than everybody else!” but really they’d just be confused, or upset they didn’t think of our idea themselves. Maybe they’d explain to us, since they are older and wiser, that every game has winners and losers. They would say it’s only a matter of time before one of us falls in love, and what happens then? One thing’s for sure—there are times when I get up off the grass or the bridge or carpeted floor of Outback Steakhouse and slip the ring down her finger and see that one stubborn strand of maple-colored hair slip down and tickle her nose…I think that I have gone too far down this path, that there can only be hurt feelings and tears at the end, so while everyone around us claps and cheers and whistles I slide my hands around her skinny waist and hold her tighter than I ever believed possible. Lucas Shepherd is a junior at The University of Iowa. His work has been published or is forthcoming in Colere, Rockhurst Review, Little Village, Daily Palette, Wilderness Interface Zone, and earthwords. 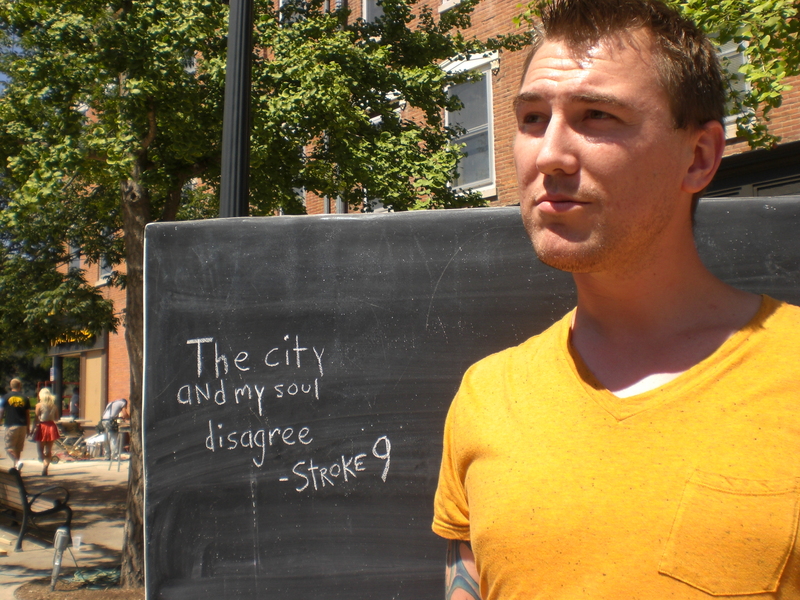 He proposed to his wife Missy only once, using chalk, a sidewalk, and a little imagination.